Is WordPress Still The King Of Online Publishing? If you are a blogger or have your own site, your site may be one of over 200,000,000 websites powered by WordPress. WordPress powers roughly 24% of all websites on the Web today (including this one) and it is currently the most popular website content management platform. As popular as it is, could WordPress become a victim of its own success and fall by the wayside as users begin to look for more convenient or easier to use options? Is WordPress still the king in online publishing and will it continue to hold sway in the months and years to come? As a publisher you want to ensure that your site’s platform gives you the functionality you need to reach your audience and convey your message. I explore some of the major options and contrasted their features with WordPress’ in this article. 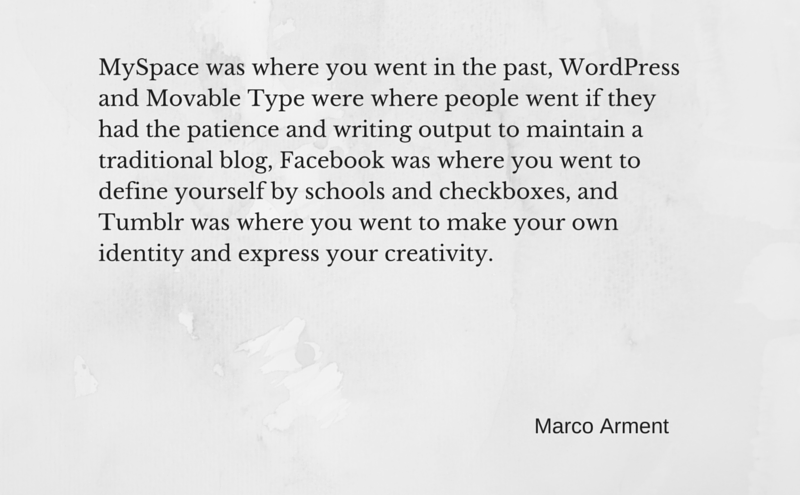 Each of these options; WordPress, Squarespace, Ghost, Medium and Tumblr, have strengths and weaknesses where I focused on three themes: writing tools, customization and social. I noticed very interesting trends and contrasts and my conclusion may surprise you. WordPress has evolved from a simple blogging system to a customizable, extensible content management system. It is probably the single most popular platform for bloggers and businesses alike. It is open source and has a thriving ecosystem of developers, designers and users, led by Automattic, the company established by one of WordPress’ creators: Matt Mullenweg. It is available in two flavors: hosted on WordPress.com and self-hosted from wordpress.org. WordPress has come a long way in the last 12 years from its earliest origins as a fork of Michel Valdrighi’s b2b blogging platform which he created in 2001 as an alternative to Blogger (created by Ev Williams and later bought by Google where it continues today) and another old blogging platform called GreyMatter. 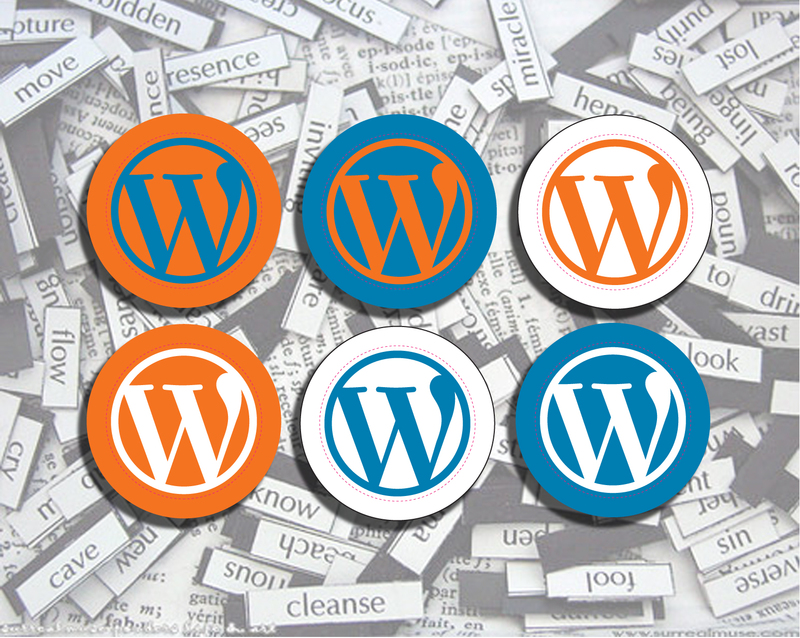 WordPress has evolved, and continues to evolve, at a rapid pace. It has a vibrant community of plugin and theme developers who contribute to a growing collection of customization and functionality options that extend the core WordPress platform. That platform is also being developed in conjunction with a passionate community of coders who work on everything from patches for annoying bugs to new releases every three to four months. The basic service is free and easy to use and has the power of a self-hosted WordPress site without the administrative headache. If you want more than the base WordPress.com service, you can pay for extras like personal domains and other features. Even with these options, WordPress isn’t for everyone and, fortunately for them, there are many alternatives. WordPress has a fairly simple social aspect. It uses a “follow” model implemented through WordPress.com and self-hosted sites that support the feature through the JetPack plugin. You can follow WordPress sites you enjoy and comment on posts that you see in your “Freshly Pressed” feed. This isn’t a big departure from the original blog-based social model from the mid to late 1990s and not as coherent as more closed systems like Twitter and Facebook which may be more effective social layers in the end. 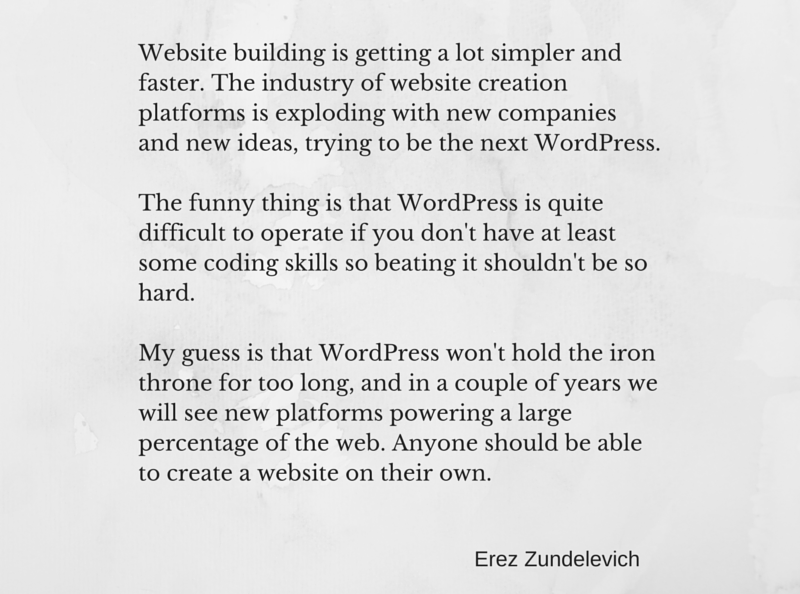 WordPress has come a long way since its early days as a simple publishing platform. It is more complex in many ways and that doesn’t appeal to everyone. It probably intimidates many less technically oriented users who wouldn’t consider attempting to install the self-hosted version and managing the logistics that accompany it. WordPress.com offers a compelling alternative to the self-hosted version. 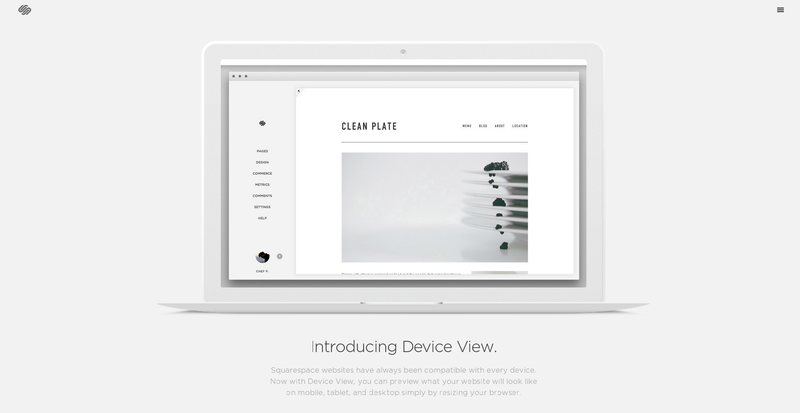 Squarespace is a fully hosted website solution. Squarespace has its own publishing and content management platform which it runs on its own servers. It is a very stable solution and, unlike WordPress, it is a paid service with a 14-day free trial. Plans start at about $8 per month and go up to $26 per month for the Commerce option (these are monthly prices based on annual subscriptions – add a few dollars if you decide to opt for a monthly subscription). Squarespace has a modular approach to building pages on your site. The interface for site owners is pretty much “click, drag and drop” and you can add text sections (including Markdown support); forms with pre-formatted options for different data types and integrations into third party services such as MailChimp, Google Drive and others; galleries and more. Squarespace has partnered with third party services such as TypeKit for a wide variety of fonts; Aviary for an integrated image editor; Dropbox integration; OpenTable blocks for restaurant bookings; Stripe for payment processing and even Google Apps for custom email using your domain. While one of the challenges with WordPress is that the basic structure of their sites tends to be very similar so it can be easy to identify just by looking at it. This isn’t necessarily a problem; there are so many themes available and they can be customized if you have some HTML and CSS skill. That said, if you want a really distinctive look and feel for your site, WordPress may be too limiting. Squarespace offers a number of beautiful themes, many of which are designed for specific types of sites such as restaurants’, photographers’ and even wedding websites. Although Squarespace has numerous integration options for social services such as Twitter, Facebook and more; it is not an inherently social service once you move beyond a blog’s basic social functionality. Unlike WordPress.com underlying social mesh that uses your WordPress account, Squarespace sites are self-contained. That isn’t necessarily a bad thing, you may not want your site to be able to connect so deeply to other sites but if you want a strong social component in your site, it is something to think about. Something else that makes Squarespace unusual is that you can create pretty large and complex sites if you choose. One feature I found helpful when I used Squarespace for a business site a few years ago is the option of adding multiple “journals” (or blogs) to the site as easily as you can add static pages. That sort of flexibility opens up some pretty interesting options. Blogs are typically used to publish articles in reverse chronological order but I found myself thinking about other types of content streams that would work well using a Squarespace journal module in place of static pages. For example, a journal allows you to publish multiple “pages” without needing to create, manually sort and next static pages (in this sense Squarespace is pretty much the same as WordPress) while keeping each “page” in a single content structure. Like WordPress, Squarespace offers users options for importing and exporting their content. This is important because it means users are not held captive by the services they choose and can use them with confidence. Squarespace’s export options cover static pages and journals although your site’s continuity on another platform will depend on whether you can import your data and maintain its integrity. Ghost takes the WordPress platform model and strips it down to its essentials. There’s too much stuff everywhere, too much clutter, too many (so many) options getting in the way of what I really want to do: publish content. WordPress no longer has a purpose. It’s no longer for anything specific, it’s for everything you can imagine doing with it. How it’s developed internally, too, has changed drastically from creating and evolving features for a publishing platform – to creating and evolving features for people to build their own platforms. Custom Post Types, Custom Taxonomies, Inline Theme Editors, Advenced (sic) Menu Systems, Multi-site, Multi-user, Multi-Everything. Using a few themes and plugins, WordPress can be turned into anything from a bug tracker, to an ecommerce store to a comprehensive social network. What O’Nolan wanted was something he could use to just write and publish his thoughts. Ghost, as he imagined it, probably seemed like a return to the earlier days of blogging where it was basically about writing and publishing with some theme support for variation. Focus on writing great content and publish it with minimal fuss and complexity. Unlike WordPress, Ghost lacks a WYSIWYG (What You See Is What You Get) post editor. Instead, Ghost users write their posts in a plain text syntax called Markdown which was created by John Gruber in the early 2000s. Markdown, like HTML, is a markup language for plain text that renders as rich text when its converted. Unlike HTML, Markdown is far simpler and more readable because the syntax is designed to be intelligible even when you read the “code”. For example, a heading in HTML is <h1>Heading Text</h1> and, in Markdown it is #Heading Text. Writing posts in Ghost is pretty easy once you learn Markdown syntax and the benefit of this approach is that you can use any plain text editor to writing your posts and copy and paste into the Ghost editor. It isn’t as convenient as a WYSIWYG editor like the one you’ll find in WordPress but it is certainly conducive to focusing on your writing. Subscribe to a Ghost Pro subscription which gives you the software, hosted by Ghost (or, at least, Ghost’s service provider). Ghost charges different subscriptions for different size sites and features. A subscription will cost you $8 each month for a personal blog with a limit of 25,000 views. If you want more blogs or the capacity to handle more blog traffic, you can pay more; between $24 for the “Advanced” subscription and $200 each month for an almost unlimited “Business” subscription. As with Squarespace, Ghost is a focused publishing platform although, unlike Squarespace, Ghost is meant for one thing: blogging. It may have started out as a simpler version of WordPress without all the complexity you find in modern installations but Ghost has become more complex since its launch and the differences are not as stark now. Ghost is more compelling for bloggers who are frustrated with WordPress and who either want a freely available and open-source platform they can install and publish on or a simpler hosted platform they can simply log into and write for. Ghost’s singular focus on blogging means that it doesn’t integrate social functionality like Medium and Tumblr. You can post automatic updates on Twitter and Facebook when you publish your posts on Ghost, just as you can using WordPress and Squarespace. The benefit Ghost offers is a stronger focus on a writing interface but it may be too simplistic for brands to use as the basis for their brand sites. On the other hand, it could be a convenient option for lightweight sites that only require a simple blog. 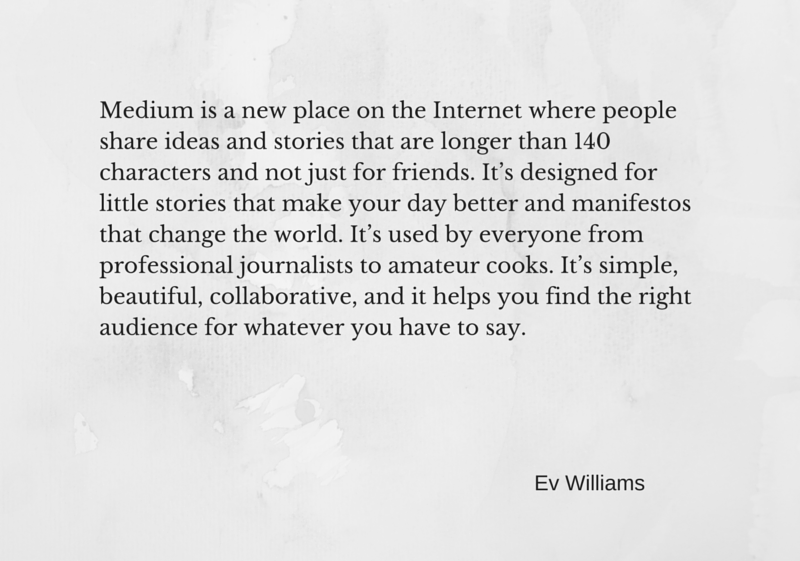 Medium‘s co-founders were Ev Williams and Biz Stone co-founded Twitter. Williams co-founded Pyra Labs which created Blogger, one of the earlier hosted blogging services that was later sold to Google. Medium launched in 2012 and, when it was first introduced in a post titled “Welcome to Medium“, the focus was on sharing stories. Last year, we set out on a mission to build a new publishing platform from scratch a place that allowed anyone to easily share stories and ideas that mattered to them and influenced others. One of our goals was to make it dead simple to write and present a beautiful story without having to be a designer or programmer. We also sought to help great ideas quickly find the right audience no matter who they came from. Recently, after months of testing and tweaking, we opened the doors so anyone could publish on Medium. Medium was initially perceived as a writing/blogging platform and this is understandable if you consider that the initial emphasis was on reading great content published by the fortunate initial users who had the ability to publish to the nascent service. Once Medium opened up to the public, one of the highlights of writing articles on Medium was the clean user interface which is truly a pleasure to use. … something published on Medium has a higher likelihood to find an audience than the same thing published on an untrafficked island on the web. That’s why I say Medium is not a publishing tool. It’s a network. A network of ideas that build off each other. And people. And GIFs (yeah, we have those, too — not our specialty, though, to be clear). Is Medium the right option for you? On one hand, perhaps. If you can present the community with compelling content they will want to share you could find the content being shared more widely than similar content published on your corporate blog. On the other hand, you are building your community on someone else’s land and you have few assurances that you won’t be evicted or downsized when it suits Medium so develop your content strategy accordingly. 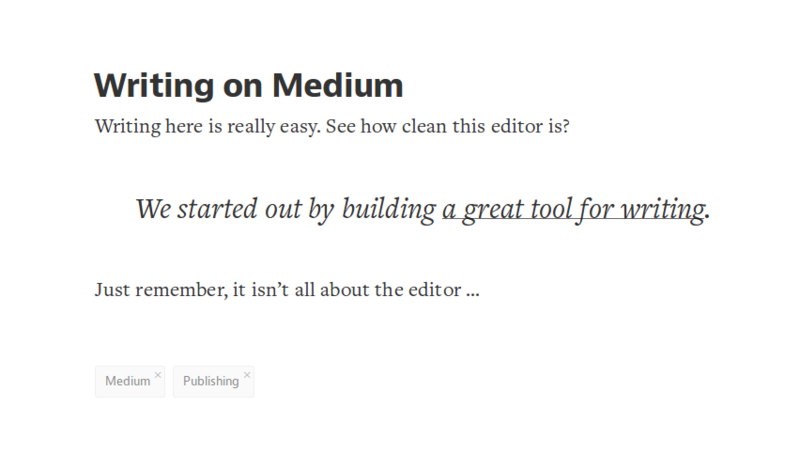 Unlike WordPress and Ghost, there isn’t a self-hosted version of Medium. That said, you can export your Medium articles in HTML format if you ever decide to migrate away from the service or simply backup your work. At the very least, Medium is a very interesting option and worth exploring. It has developed into a platform whose community prizes good quality writing above cheap shots. Tumblr is less of a blogging platform and more like a longer form Twitter with pre-defined post types to help you share photos, quotes, chat transcripts, video, audio and, yes, even text-based posts too. Tumblr is for sharing and the functionality built into it is designed to facilitate more sharing. Rather than commenting on posts (Tumblr doesn’t support comments natively), you are encouraged to “reblog” Tumblr posts (the idea may have been borrowed from Twitter’s “retweet” feature). You can also like posts and share them on other social networks like Twitter and Facebook. … For younger people, Tumblr is about a feeling, not information. I concluded that what we needed on Tumblr was a focus on whimsy. We also needed to narrow our subject to what was likely most important to our audience: the Princeton University Archives (that is, materials directly related to the history of Princeton). The design of our Tumblr page reflects what I wanted to convey: Yes, we’re a special collections library with a lot of old stuff, but it’s cool old stuff. We don’t take ourselves too seriously. We’re not always going to try to teach you about the storied history of Princeton—although you will get a sense of that if you keep reading for a while. Instead, like the Comedy Central show, Drunk History, we show you the things that make those of us who work in the archives laugh. Along the way, we also tell the story of Princeton in bits and pieces in a format we hope is entertaining and visually appealing. Tumblr’s essence is social. It is more of a social network though it works fairly well as a blogging platform too. In fact, Tumblr’s post types implementation is the easiest to use when compared to how WordPress and Squarespace handles post types for options such as text, images and video. The mobile experience is also really well designed and easy to use. One of the challenges with Tumblr is that it isn’t always easy to export your content and maintain your site’s integrity if you decide to migrate it to another platform. WordPress has an import option for Tumblr blogs but you’ll need to pay careful attention to the URL structure of your posts if you don’t want to break all your links. One use for Tumblr is as an adjunct to your primary site just as you would use your brand’s Twitter or Facebook profiles as extensions of your main site. There is arguably more overlap between Tumblr and a site built on a blogging platform like WordPress, Squarespace or Ghost and that is something to consider, especially if you want to maintain clear distinctions between your various profiles and your main site. If you see Tumblr as a viable platform for your whole site, you can map your domain to a Tumblr blog so links to, say, yourbrand.com will map to yourbrand.tumblr.com seamlessly. In that case, you can configure your Tumblr site to publish updates to Twitter and Facebook when you publish your masterpieces. If you were hoping for a clear winner, I don’t think I can offer one. There isn’t a “one size fits all” option that will satisfy everyone. Squarespace sites are beautiful, run on notoriously scalable servers and their integrations and customisation options are arguably easier to incorporate than WordPress’ options. In the final analysis, it may not be as costly as it may seem but you can likely build a site that is cheaper to operate and host using WordPress. 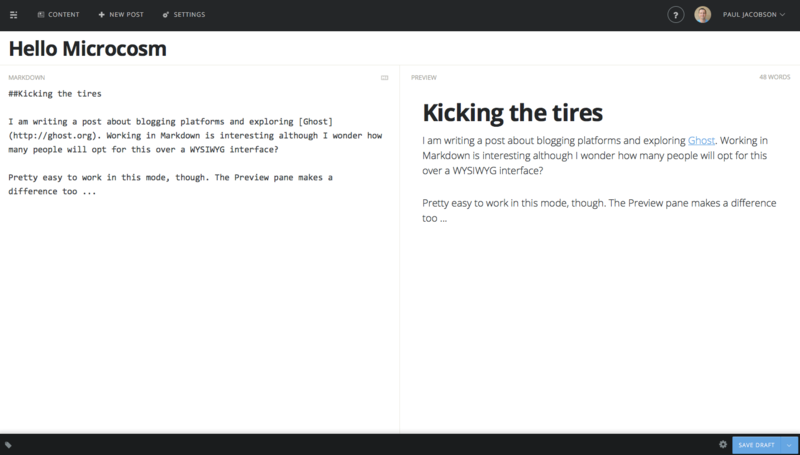 Ghost is an interesting option but it seems to be better suited to focused blogs written by writers who have a passion for Markdown (like me, although WordPress supports Markdown too). Ghost is probably more for bloggers than brands but building a campaign site using Ghost could be interesting. Medium and Tumblr are fairly niche options. Medium is for writers, whether the articles are longer form pieces or shorter updates. Tumblr places more emphasis on social and rich media. It also skews more towards a younger audience so if that is the market you want to reach, Tumblr could be a big part of your outreach efforts, if not your core platform if you are feeling bold. WordPress still comes closest to being that best option for most use cases because it is established, robust, customisable and flexible. You can do a lot with WordPress and you don’t need to be intimately familiar with CSS and HTML to create good looking and capable websites. The self-hosted version from wordpress.org is relatively easy to install and there is a lot of step-by-step documentation to guide you through a typical installation process. If the self-hosted version isn’t for you, WordPress.com is a compelling alternative.